Oh my, am I in a quandary! I like perusing shoe retailers best seller lists to see what the shoe buying public is purchasing to adorn their feet. 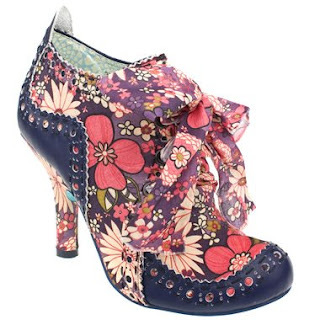 Today I was looking at Schuh's list and came across these offerings from who else but Irregular Choice. And do you know what? I think I kinda like them. I can only picture them peeping out from under some camel cord flares or some other suitably 70s inspired outfit but I like shoes that can do that. In any other circumstance though, I'd be running away from them. Which then makes me think who is wearing them and with what? Oh my gosh - you know what? They'd look supercute with a high waisted skirt, and maybe a white bluse? I'm not too crazy about the bow thing, but I suppose you could do something about that. I friggin love them. I'd wear them with a really simple outfit like, wide leg jeans and a white tee, big glasses, long chain. Yay.